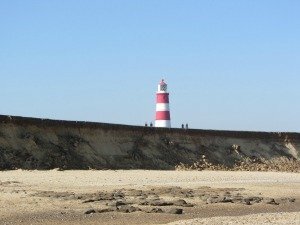 What does Wells beach have that others don’t? 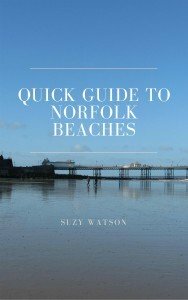 For me, Wells beach is the best beach in Norfolk, and let me tell you why. 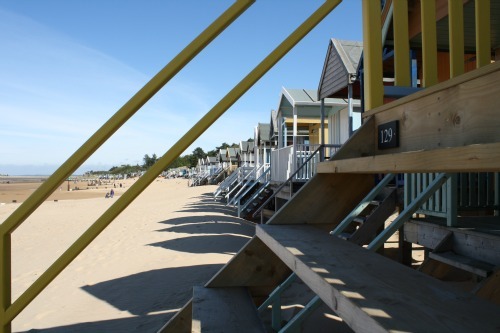 Just a stone’s throw away from the harbour town of Wells-next-the-Sea, this Norfolk beach offers everything you could want from the perfect English beach. 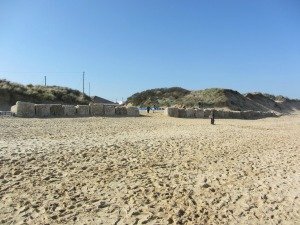 Wells-next-the-Sea beach car park – how can that be exciting? 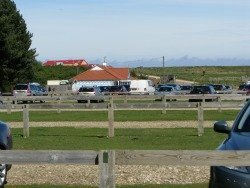 Starting with the car park - I love the Wells beach car park. 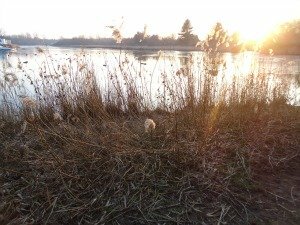 Yes, I know that may come across as a bit strange, but there are 3 reasons for this, no, in fact 4 reasons which you may be curious to find out. 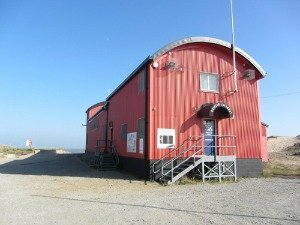 The first is the parking spaces, divided by wooden post and rail fences (which was updated in 2016). I think this little touch makes it all the more attractive as a car park. I like to be greeted by grass and nature rather than boxes painted on tarmac. 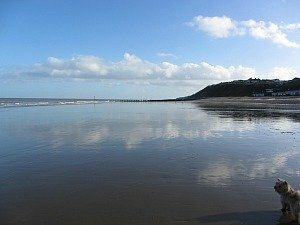 You’re going to the beach to enjoy yourself, so why not start off in the right frame of mind! Relaxation. 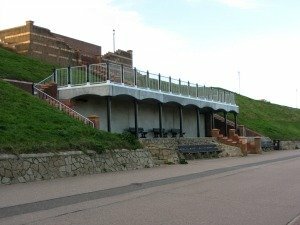 Third, there is a café at the other end of the car park, which, if you can’t get around to making a picnic because you’re on holiday and want to chill out, or don’t want to carry one because you don’t want the hassle, then why not indulge yourself and pop into the café for a change. It's also extremely dog friendly. The fourth reason is the best one of all. 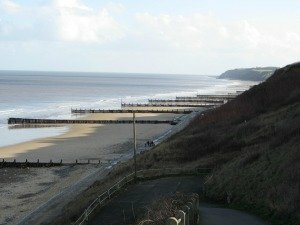 Many of the North Norfolk beaches require a bit of a walk to the beach. 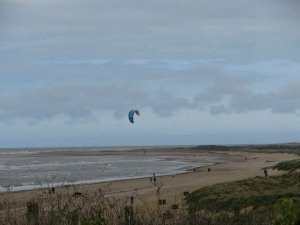 Wells beach is literally just over the dunes from the car park, with steps up to the top of the dunes and then, once you’ve reached the top you get the wonderful view of the beach, and down you go to feel that lovely loose sand in between your toes. 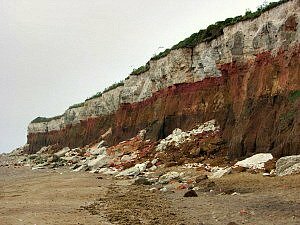 You’ll get that “WOW” factor as you get to the top of the steps and look down on this fantastic beach. 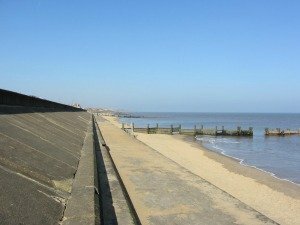 NEVER did I think I would find 4 exciting things to say about a beach car park! 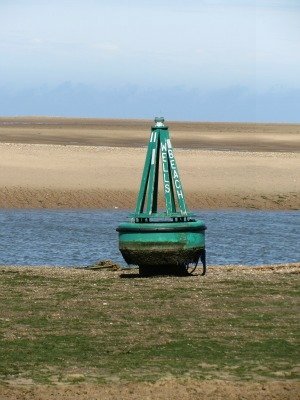 If you want to see more pictures of Wells beach, head over to my Norfolk Video gallery. 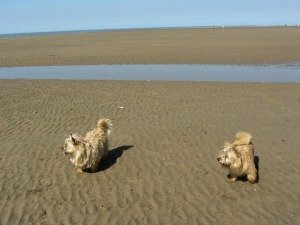 Yes, this is a great beach for bucket and spades, whether the tide is in our out. 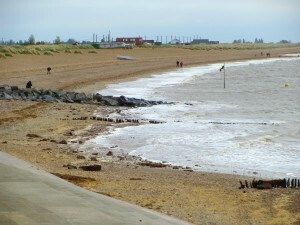 If the tide is in, you still have that wonderfully soft sand right up to the level of the beach huts and sand dunes. Not great however for body boarding as the waves aren’t huge, but could be used as a float on the little pools left as the tide goes out. 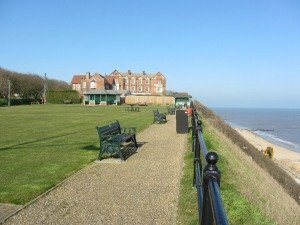 Other child friendly beaches on the West and North Norfolk coast are Heacham, Old and New Hunstanton, Sheringham, Cromer and Mundesley. 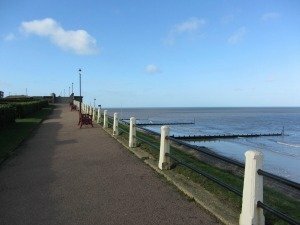 This is one very dog friendly beach (with the exception of the east side which is on the right as you come down the steps towards the sea and by the beach huts), but that’s not an issue. Dogs are an important part of my life, and maybe for you too. They absolutely love it here. 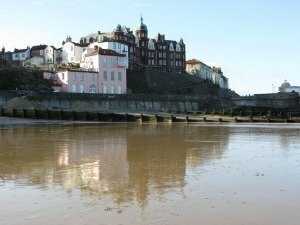 Low tide is obviously best as the sands stretch for miles and the lovely hard sand makes it great walking for them, and for you too. 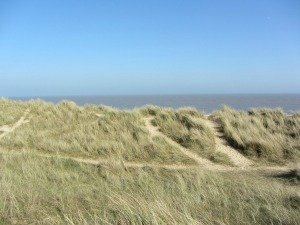 If you walk far enough out towards the sea you get to a stretch of sand dunes, where you can sit, sheltered from the wind if it’s that kind of day, and just let those doggies loose without a care in the world. 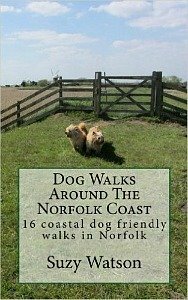 It makes you realise how great Norfolk UK and England are. 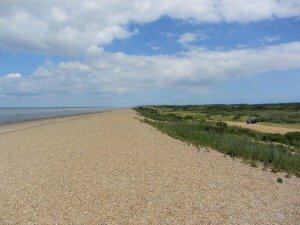 But please - pick up your dog poo and put your bags in the bins provided - don't leave the bags lying around on the beach, it is incredibly unsightly and, more importantly, it actually ruins the environment on this Nature Reserve. 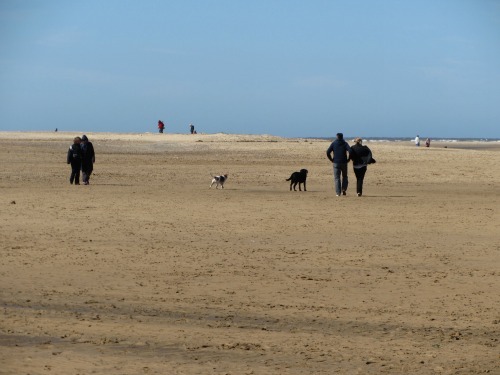 Carry on walking westwards and you’ll eventually come to Holkham beach, another amazing dog walking beach. 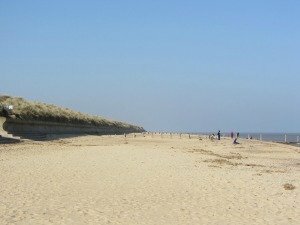 The great thing about Wells beach is that you can then retrace your steps and come back along the edge of the beach to have a look at all the wonderfully decorated and named beach huts. Some people have a great imagination and you’ll get great enjoyment from looking at them. 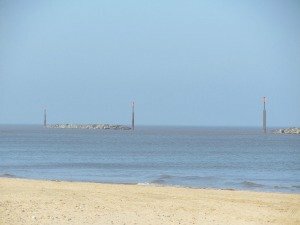 Think up some names yourself – a great game for bored kids – although quite how they can be bored on this beach I don’t know! 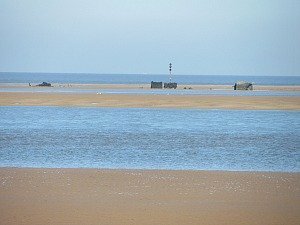 Here are just a couple of names of beach huts on Wells beach. And many other great names, but I’d hate to give the game away! Some are painted in fantastic colour schemes, they really are worth taking a look at. 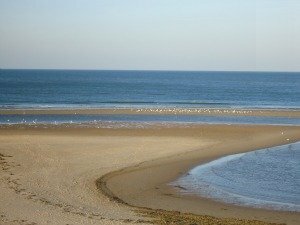 When you go to the beach you either choose to get away from everyone, or stay close to amenities and accessibility. On this beach you can do both of these things. 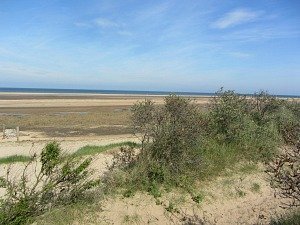 Wells isn’t just a beach - on the other side of the sand dunes nearest the car park is a wonderful pine walk, comprising the Norfolk Coast Path and Peddars Way. 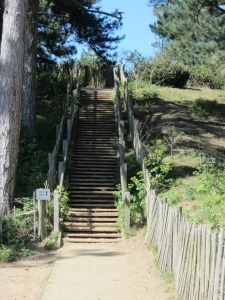 In fact you can criss-cross these paths with the beach, going over the dunes into the wood or vice versa to the beach. 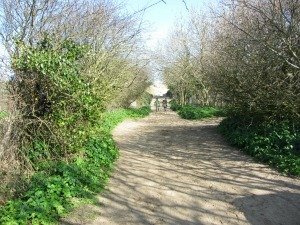 This path will also take you all the way to Holkham beach (2 miles), and on a sunny day it’s welcome shade from the sun. 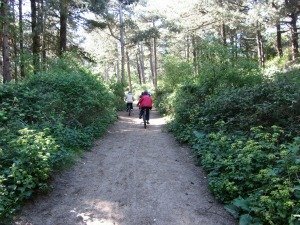 The path runs alongside the boating lake from the Pinewoods Holiday Park and runs through part of the Holkham Nature Reserve, the main section of which stretches from Wells-next-the-Sea to Holkham, so if you’re a great bird watcher, nature enthusiast or rambler, this is a superb place to come and watch the wildlife habitats at work – grab an ice cream, don your binoculars and have a fascinating walk along the Norfolk Coast Path.We organise walking holidays along this particular path which may be of interest to you. 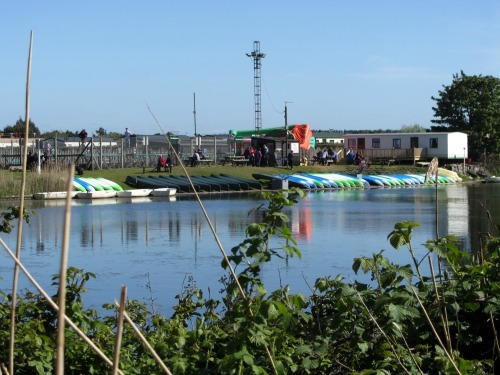 Last, but not least, you've got Pinewoods Holiday Park. 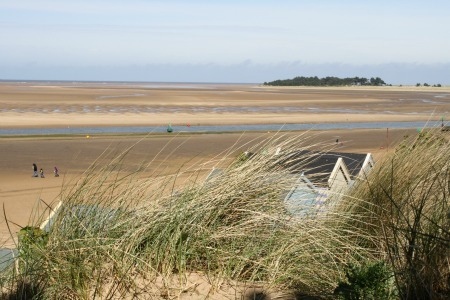 Whatever type of camping you're doing, whether it be in a tent, staying in a static caravan or bringing your own mode of transport, it's right on the edge of Wells beach, so it couldn’t be a more convenient place to stay. 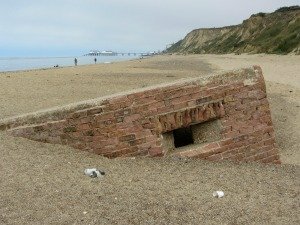 However, once on the beach, you never get the feeling that there’s a holiday park right next door. 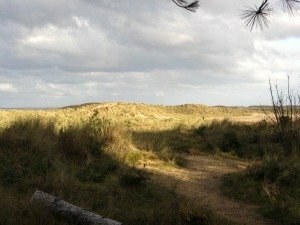 That’s what I love about Wells beach, you just go over the dunes and you’re transported to another world. 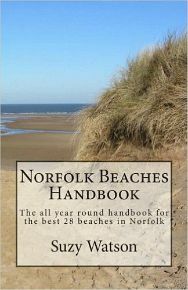 Of all the Norfolk beaches, this is my top choice, but I am biased as I love it for dog walking more than anything else.